When I grow up and my children have moved on, or at least can fend for themselves pretty well, I want to be one of those women who notices younger mothers with young children. In church, for example. And instead of just gazing off into the distance and remembering fondly those days with young ones (or shruggingly thinking, "Better you than me- I'm glad I'm not at that stage any more. "), I want to DO something for them. Take them a meal. Go over and play with her kids while that younger mother takes a nap. Or takes a shower. Or looks at the clock to see what time it is. Or goes outside the house for a walk or to get groceries by herself. Or, go to her house and teach her children a skill or do a craft with them. Do you know why I want to be that when I grow up? Because I've been inspired by a woman and her daughter who have done similar things for me. This woman is not a relative, who may feel some duty to relieve me. She's a woman from church, a friend and a mentor. Thank you, friends. Thank you for helping me figure out how I want to spend some of my time when I (one day...) have some more of it. 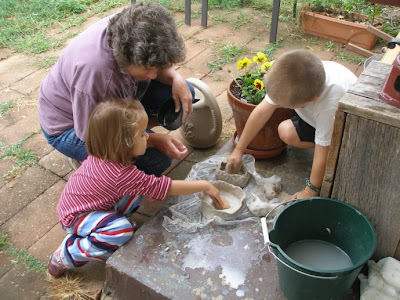 Here is said woman, teaching my kids to make pinch pots. Wow, now that is one to live up to. What a gem. I love people like this, and I want to be one of them, too ... someday. When I go to heaven I want to be all used up!